Interpretations of the Special Lessons Numbers (Numerology Lesson 26) | Law of Attraction Plus: The Secret revealed! Just as Special Trait (talent) numbers are the numbers that that repeat an average or above average number of times in your name, Special Lessons are when you have lower-than-average occurrences (or no occurrences at all) of a particular number. Also again, here's the table that shows you what the average equivalence is for each number in a name. 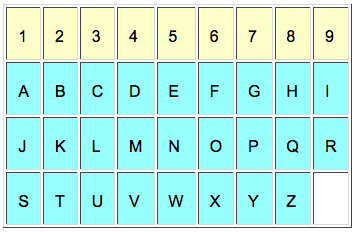 Simply count up the letters in your name and compare them to the chart above to figure out which numbers repeat in your name at a low average rate or not at all. Then refer to the interpretations below, which tell you a lot about your karmic issues, obstacles in life and limitations that may be caused by your character traits. Two or less 1's (below average): You are a "born follower" and don't like to take charge. The less responsibility you have to worry about the more comfortable you are with life. You may lack self-esteem or confidence or be so scared of failure that you don't even try. No 1's: You may be extremely irresponsible or limited intellectually or emotionally. You may have trouble taking care of your own basic needs. possible below average occurrence of 2's in a name is none. No 2's: You lack patience and sensitivity. It may be difficult to acknowledge that there is more to reality than what goes on in your head. This limitation may be the result of emotional damage done in childhood or an actual physical limitation. At any rate, you lack the capacity to understand or relate to others. One or less 3's (below average): You may lack perception or be particularly clumsy especially when it comes to handling a paintbrush or musical instrument. You may be shy and suspicious of other people and prefer to spend time by yourself. No 3's: You may have a pathological aversion to spending time with other people. You might also have a fear of crowds. The root of your fear is shame possibly caused by a traumatic event or bad childhood. You are more prone to paranoia then others. 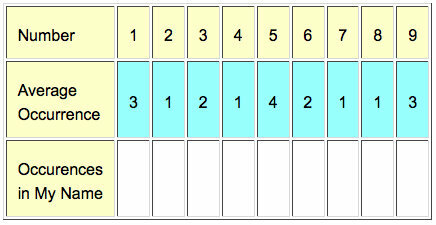 Note that as one 4 is the average occurrence, the only possible below average occurrence of 4's in a name is none. No 4's: Chances are you will be unwilling or unable to work for most of your life. This could be due to a disability or to a permanent "Monday Morning" feeling. Your capacity to earn is compromised and economic hardship is very likely, as you are not willing to put an effort into much. Three or less 5's (below average): You are an introvert who does not feel at ease in a crowd. You may find facing changes to be very traumatic. You are a creature of routine. No 5's: It is very rare to have no 5's in your name but this would represent a person who lives in his or her own little world. The worst case scenario would be autism or schizophrenia. One 6: You are likely to be a very disorganized, disloyal individual who finds it hard to keep their mind on one thing. You may find it too much "work" to get involved with others emotionally and prefer to be emotionally detached. No 6's: A person with no 6's may be criminal or completely untrustworthy. There is no trust of the self or the perception of his or her reality. Addiction and escapism may be a problem. Note that as one 7 is the average number of occurrences, the only possible below average occurrence of 7's in a name is none. No 7's: You may be limited intellectually or academically. Your ability to analyze and perceptions may be a bit "off" compared to other people. For this reason you are often misunderstood. Note that as one 8 is the average number of occurrences, the only possible below average occurrence of 8's in a name is none. No 8's: Chances are you will not accumulate much wealth in your lifetime. You may have to work hard to earn every penny you make. However material things may not mean as much to you as someone with a more ambitious drive so you are probably accepting of this condition. Two or less 8's (less than average): You are a pessimist and not likely to believe in a higher power. You may find it difficult to connect with other people or to fall in love. No nines: You may suffer from depression or another mood disorder. You have little faith in humanity or yourself possibly due to a very traumatic experience. 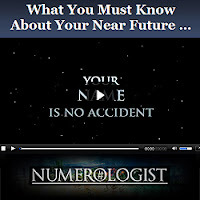 In the next teaching we are going to tackle the complex but extremely intriguing matter of discovering the Essence of a name using numerological divination techniques.